Use the Wrap Text button on the Home tab of Excel 2010 to wrap lengthy text in a cell by displaying it on multiple lines within the cell. This feature helps you to avoid the problem of having to abbreviate text or widen columns in order to display all the text contained within cells. When you select Wrap Text, Excel continues to use the horizontal and vertical alignment you specify for the cell. Select the cells containing text you want to wrap. On the Home tab, in the Alignment group, click the Wrap Text button. To accommodate more than one line in a cell, Excel 2010 automatically expands the row height so that all wrapped-text entries are visible. A new worksheet with the column headings formatted with the Wrap Text option. 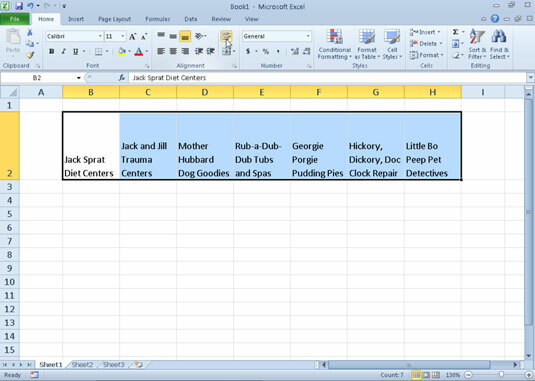 If you want to wrap a text entry in its cell and have Excel justify the text with both the left and right borders of the cell, select the Justify option from the Horizontal drop-down list box on the Alignment tab in the Format Cells dialog box (press Ctrl+1 to display the Format Cells dialog box). You can manually break a long text entry into separate lines by positioning the insertion point in the cell entry (or on the Formula bar) at the place where you want the new line to start and pressing Alt+Enter. Excel expands the row containing the cell (and the Formula bar above) when it starts a new line. When you press Enter to complete the entry or edit, Excel automatically wraps the text in the cell, according to the cell’s column width and the position of the line break.